As a loyal Huron-Countian and supporter of local business, I thought I had discovered all of the neighbourhood gems. This past Friday, however, I got the chance to take a break from the books and go out for dinner at The Fireside Cafe on Highway #4, just outside of Wingham. Growing up, I did not visit North Huron much (other than for soccer games), so I feel as if I have a lot of catching up to do in this area. When I heard a lot of talk around town about The Fireside Cafe, I decided it’d be a great way to spend my Friday visit back home. As I pulled up, I was intrigued to see what was inside this little building on the side of the road. We were greeted with a smile into this trendy little establishment, and it embodied a welcoming and warm atmosphere that made the Fireside Cafe true to its name. It got even better when I saw that they offered a salad bar with the stuffed chicken special, so before I even sat down I knew what I was having for dinner. My Grandma, Polly, decided that she would indulge in the other special, and chose the fish; A lightly battered roughy with a dill cream sauce. This time, she seemed very reluctant to share a morsel of her fish with me, but thankfully for the sake of writing this article for Ontario Travel Diva’s, I can vouch for the fact that the Fireside Cafe can whip up a mean roughy. Thanks, Grandma and thank you Fireside Cafe for a wonderful night out! My stuffed chicken with garlic mashed potatoes and seasonal vegetables. 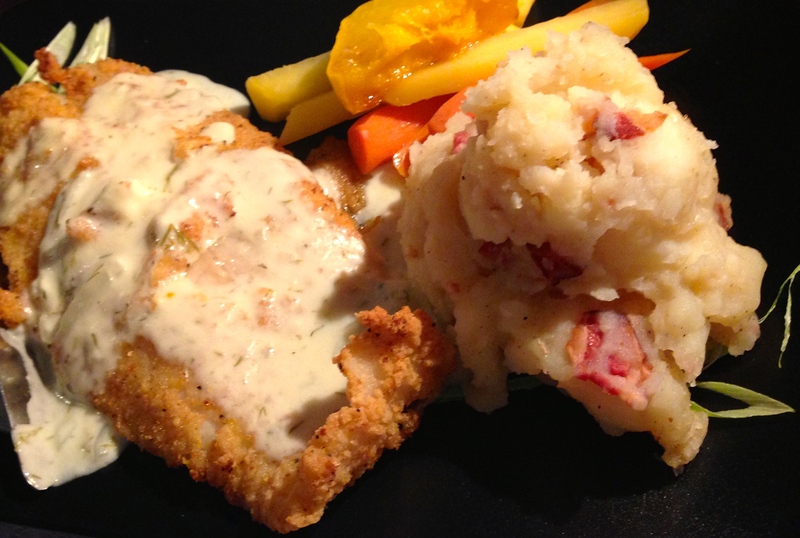 Grandma Polly’s lightly-battered roughy with a hot potato salad and veggies. The Fireside Cafe offers an all-you-can-eat buffet on Saturday and Sunday evenings which includes soup, salad and the dessert bar. Must Try: Homemade tortilla chips and salsa from the salad bar. They also feature a wonderful Sunday brunch from 11:30am-2:00pm on Sundays. They even have a menu for gluten-conscious diners! Polly looking pleased about her pecan flan. The smorgasbord of desserts that The Fireside Cafe offers. Decisions, decisions!